Sayaka and Japan, we’re still thinking of you. What can we do? When I’m home I’ve got the news on and it’s 24 hour news of Japan. Unfortunately, the news keeps getting worse. Are you still okay? 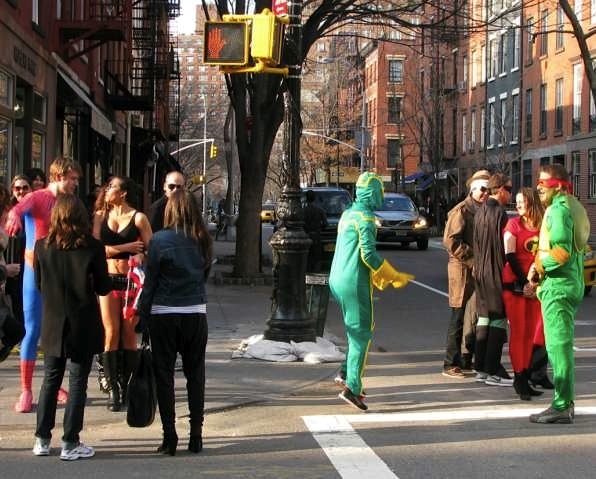 There were a bunch of super heroes on Perry Street yesterday. This isn’t all of them, this is the group that got caught by the light. If you see them again, take more pictures! One of those guys looks like the guy in the hat in my picture! Stacy, thanks for letting us know about your email from Sayaka. Last night I dug out my old computer and tried to send her an email also offering assistance. So far I have not heard back from her. Today I understand that now a volcano has gone active in southern Japan. Truly devastation has fallen on that country and its people. Sayaka, if you’re reading this, you know we are concerned about you and your family and friends, and this terrible plight that has visited Japan. Is it just me, or does it seem that nearly every superhero is staring at the gal showing some skin? Spiderman seems most impressed. Yes, let’s all keep the people of Japan in our thoughts and contribute to the charities of our choice that will lend a hand. So far, there have been no stories of looting or cruelty and that says a lot about the culture, spirit, and dignity of the people. The news is still depressing. More blasts, few people to rescue. And yeah, the bikinied super hero was quite popular!